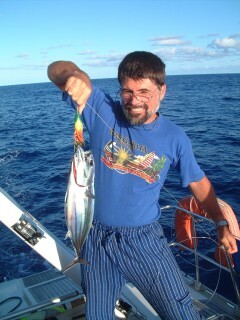 Jon pulls in a nice tuna for dinner! After 4.5 months(!) in the Kingdom of Tonga, we're finally moving on. Christopher has to take his University entrance exams (SATs) this Saturday, and the only place out here that gives them is Suva, the capital of Fiji. The sail so far has been a bit challenging. The southeast trades seem to have moved around into the south or even southwest, forcing us to close-reach as we sail west! When we left Neiafu, we had to motor for several hours before we found any breeze at all, and then several more before we could sail, but we caught a nice tuna. We now have 8-12 knots of breeze from 60-80 degrees off the bow, which is delightful. Today the skies have been clear and blue with only a gentle swell going NW. Between Tonga and Fiji are a line of islands collectively called the Lau group, which we're not allowed to stop at before getting permission (and paying $1,000) to Fiji. Our original plan was to go south of this group but the wind forced us to change plans, so now we're heading through the middle of the group. Since the charts out here are all inaccurate, we need to go through in daylight. If these winds hold, we should get to them tomorrow morning, which should be perfect. Even so, a Danish boat hit one of the Lau reefs several weeks ago, so we'll be paying close attention.